The Heisman trophy winner had been selected in the first round of last year's MLB draft. Kyler Murray, a Heisman trophy-winner and first-round Major League Baseball draft pick, announced Monday that he is "firmly and fully committing" his life to becoming an NFL quarterback. The former University of Oklahoma quarterback was selected by the Oakland Athletics as the ninth overall selection in last June's MLB draft. The outfielder agreed to a minor league contract that included a $4.66 million signing bonus. While Murray declared for the NFL draft in January, there was still some speculation over whether he would pick playing baseball over football. Just hours before Murray's announcement, Oakland officials said talks with Murray were continuing. But Murray put an end to all those questions Monday with a statement posted on Twitter. "I was raised to play QB, and I very much look forward to dedicating 100% of myself to being the best QB possible and winning NFL championships," Murray's statement read. 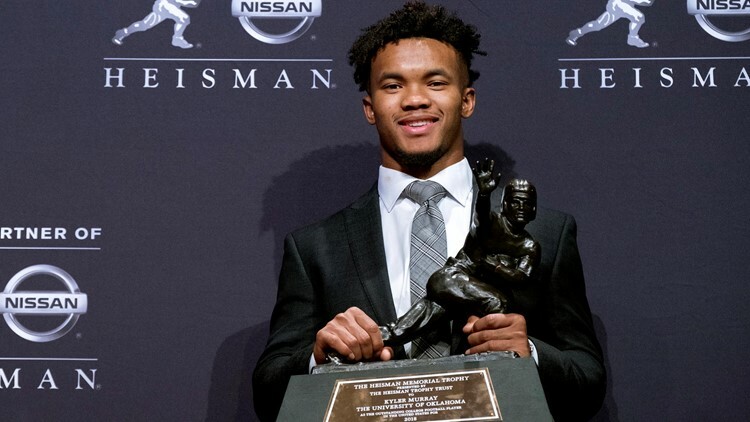 In this Dec. 8, 2018, file photo, Oklahoma quarterback Kyler Murray holds the Heisman Trophy after winning the award in New York.